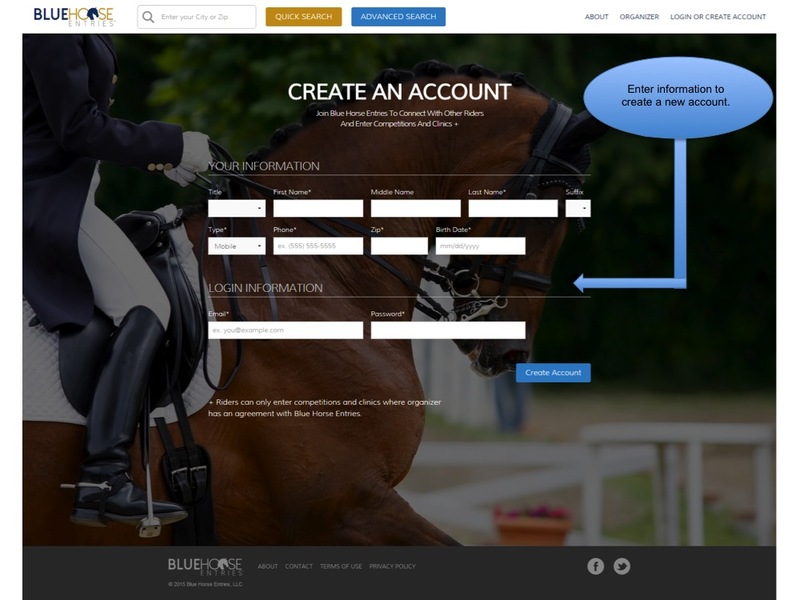 Common questions and answers for Blue Horse Entries. 1. Do I have to setup a rider account? 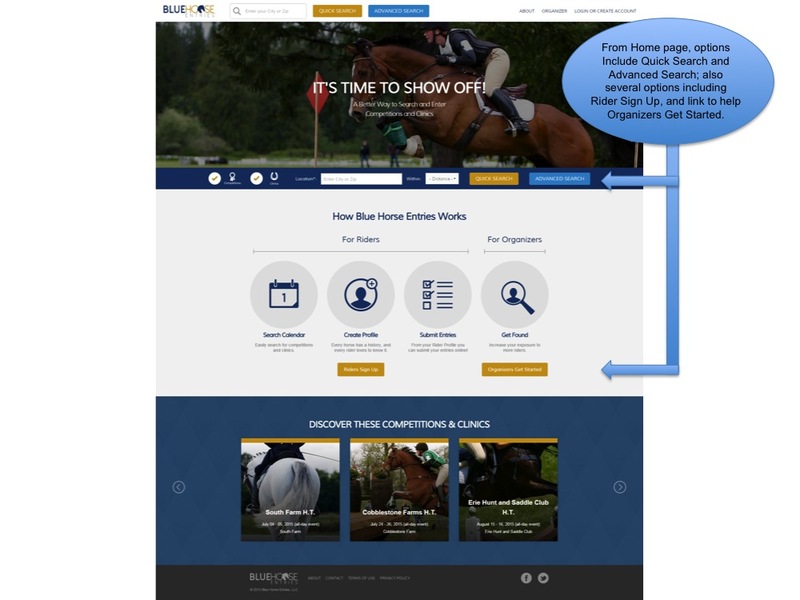 If you just want to apply to ride in a clinic, search for competitions or clinics, or just stroll through our website to learn more about the sport, you do not have to have an account. 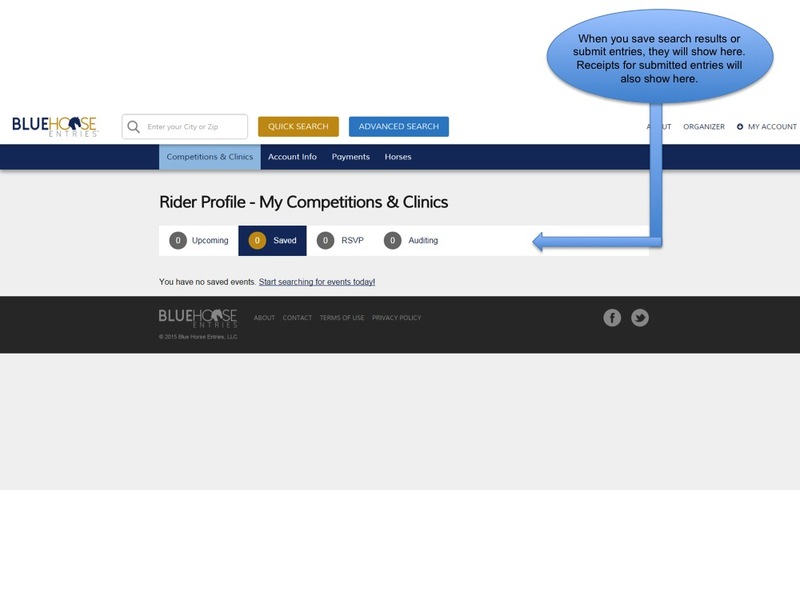 However, if you decide you want to ride in a competition or a clinic, that you want to audit a clinic, or that you want to signup/register for any other event, you will need to setup a rider account. You must be age 13 or older to setup an account. If you are under age 18, your parent or legal guardian must setup an account and then add you as a rider before proceeding to the entry. 2. Is there a cost to setup a rider account? 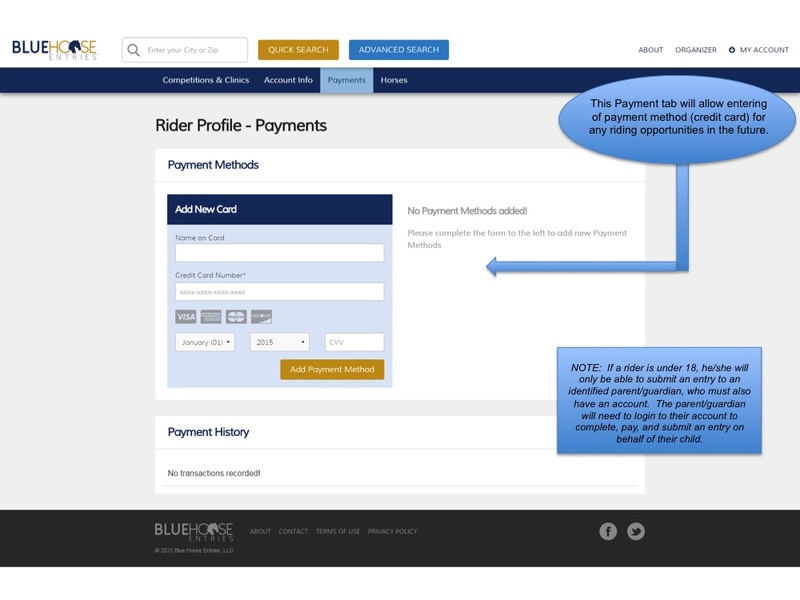 There is NO COST to setup a rider account. (See “Do I have to setup a rider account?”) There are several benefits of having a rider account aside from being able to submit an entry. This includes, among others, being able to add an event to your calendar with the click of a button, and being able to save search results to your profile for easy access. 3. How do I enter my child? All riders under the age of 18 must have a parent or legal guardian either submit, register, and/or signup on behalf of the child. 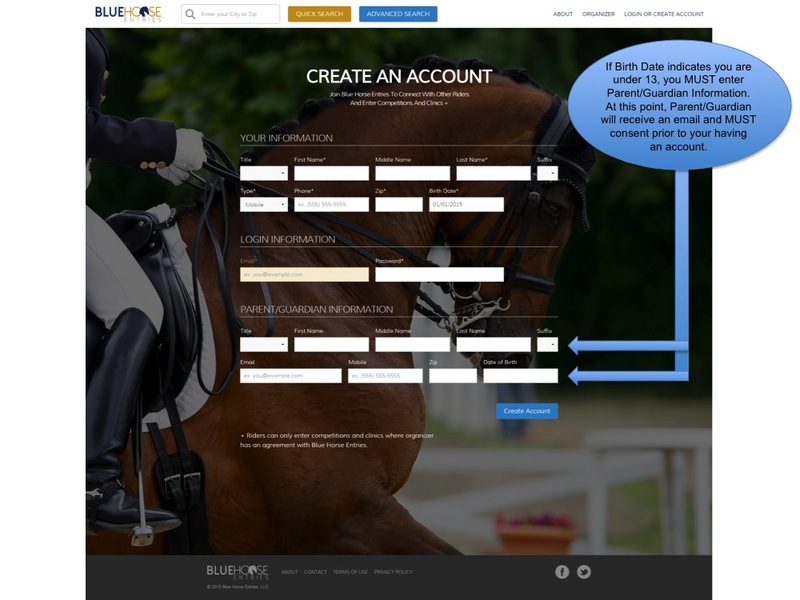 This means the parent/guardian will need to create his/her own rider account, providing his/her own information – even if not really a “rider.” Once that account has been created and Account Info provided, then the parent/guardian would click on the tab “Riders Under 18” to add his/her children under 18. 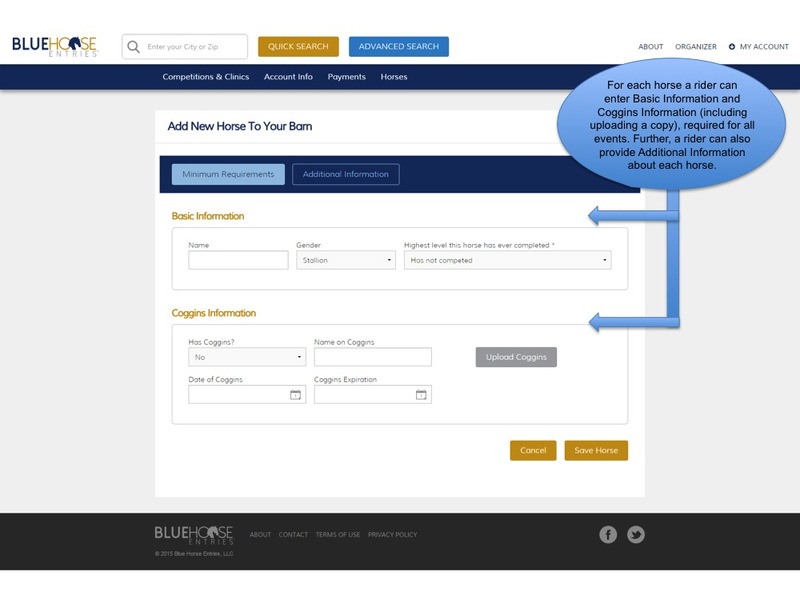 Then, when ready to submit an entry, be sure to select the correct person and proceed as usual. 4. How do I enter an adult to ride a horse I own? 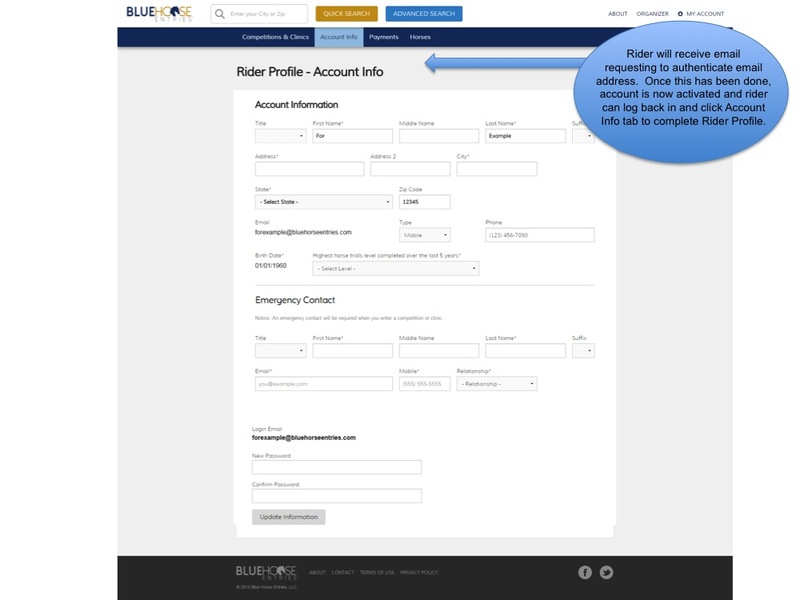 Each rider must have an account, and the unique identifier is the email address. 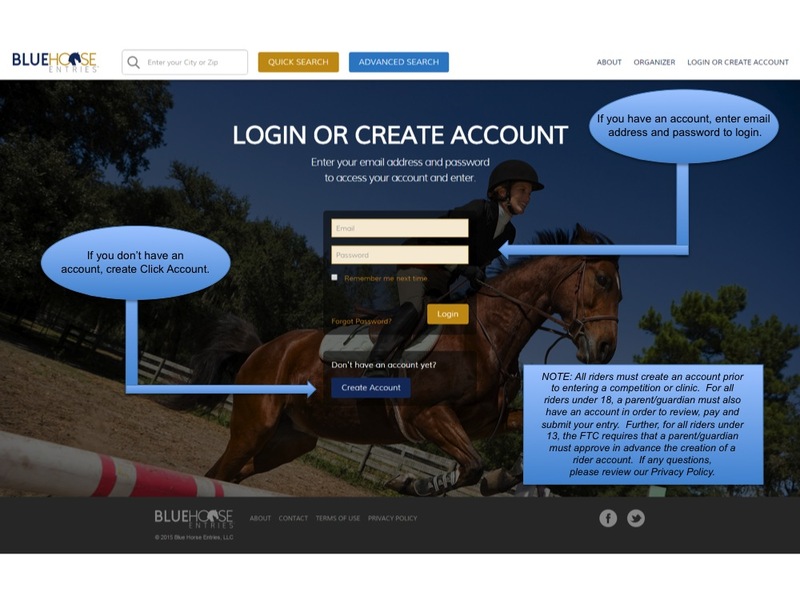 So long as you have permission to submit entries, sign waivers, and agree to all terms on behalf of the rider, you can setup an account on behalf of your rider, providing the rider’s information. All emails will be sent to the email address provided for that account. 5. Can I enter more than one rider on the same entry? 6. Can I submit an entry for multiple horses? Yes. 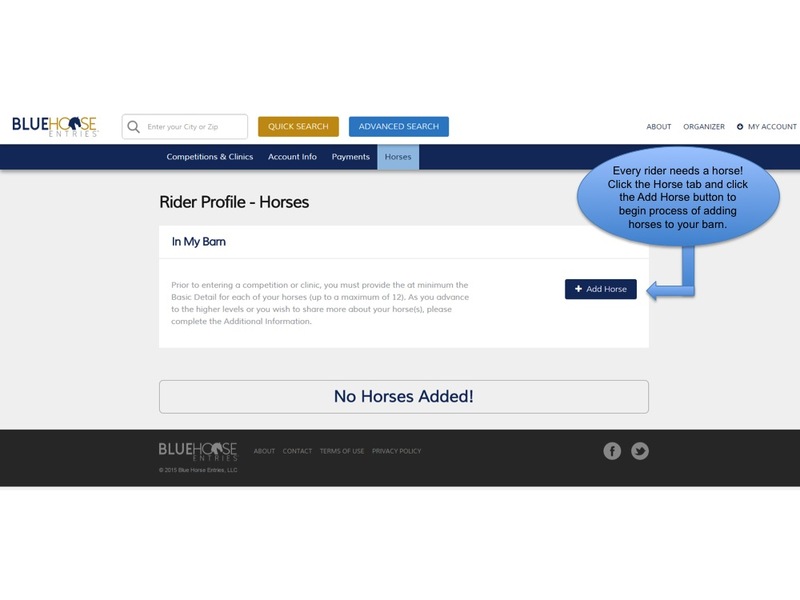 Only one rider per entry, but that one rider can ride multiple horses in the same division or in multiple divisions – so long as the horse and rider combination are qualified, and it is permitted by the organizer and secretary. Just be sure to select the right horse and the right division. 7. Can I enter multiple levels on the same entry? Yes. 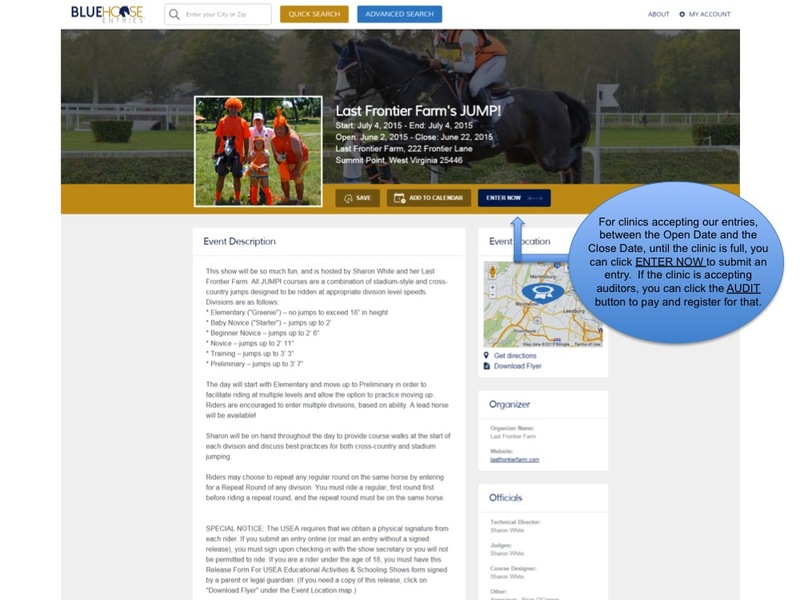 Only one rider per entry, but that one rider can ride in multiple levels or multiple divisions – so long as the horse and rider combination are qualified, and it is permitted by the organizer and secretary. Just be sure to select the right horse and the right division. 8. Can I upload my horse’s Coggins to my account? Absolutely! 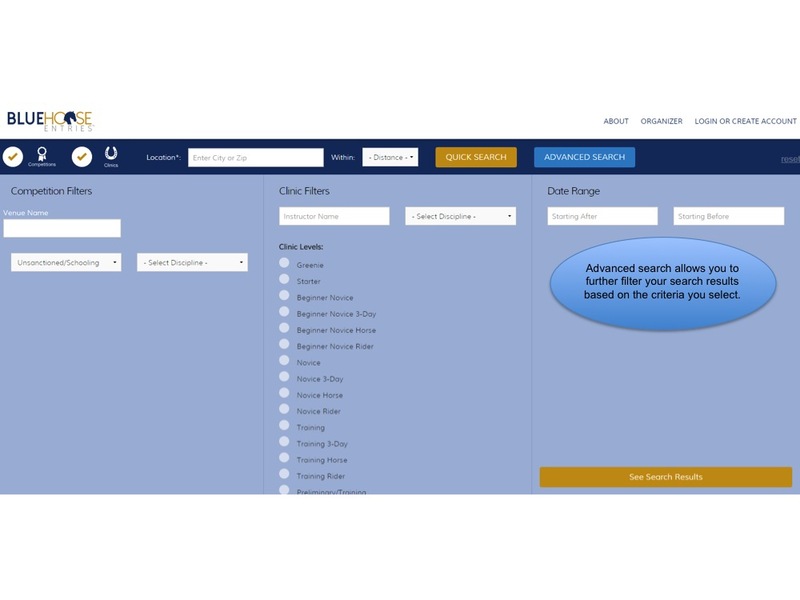 Whether for you or your child under 18, you can add horses to your virtual barn under the Horses tab. For each horse added, you can choose to upload the Coggins for that horse. If you do this, the Coggins for that horse will be automatically submitted every time you enter that horse. It is not required that you provide when you add your horse, and even not required when you submit an entry; however, when required, the organizer, secretary, and/or facility will need to see the Coggins for each horse before you can enter the facility and/or ride. 9. How do I indicate my stabling requests? 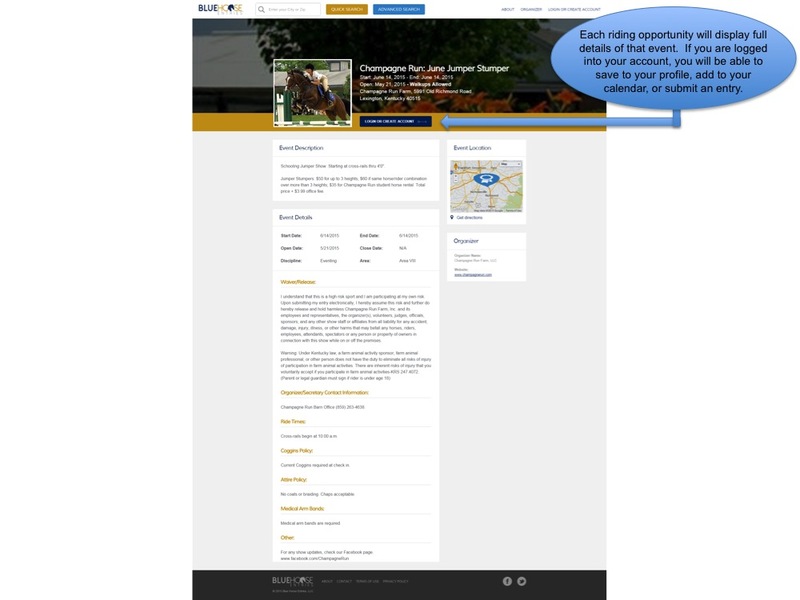 For recognized eventing shows, you will need to comple the stabling questions as you prepare your entry. For schooling show, clincs, camps, and others, when you see the box titled SPECIAL INSTRUCTIONS, be sure to note any requests you have. The organizer and show secretary will always do their best to accommodate all requests (but if it isn’t there, they won’t know). 10. What if I receive a message that says, "Error in exception handler"? This means the card has failed; the charge was not allowed, and the entry has not been submitted. Most common, the numbers on the card have been entered incorrectly, or if the card was already there it may have expired. Occasionaly, the provider may put a hold on the charge until you call to say it is OK. At that point, you can return to pay and submit your entry. An entry cannot be submitted if full payment has not been made to a valid card. 11. What are the costs to setup an organizer account? It is FREE for you setup your own account, plus it is easy and does not take long. We will provide you with the information you will need to have ready in order to link your account with us to your bank account, and then it is as simple as filling in the blanks. 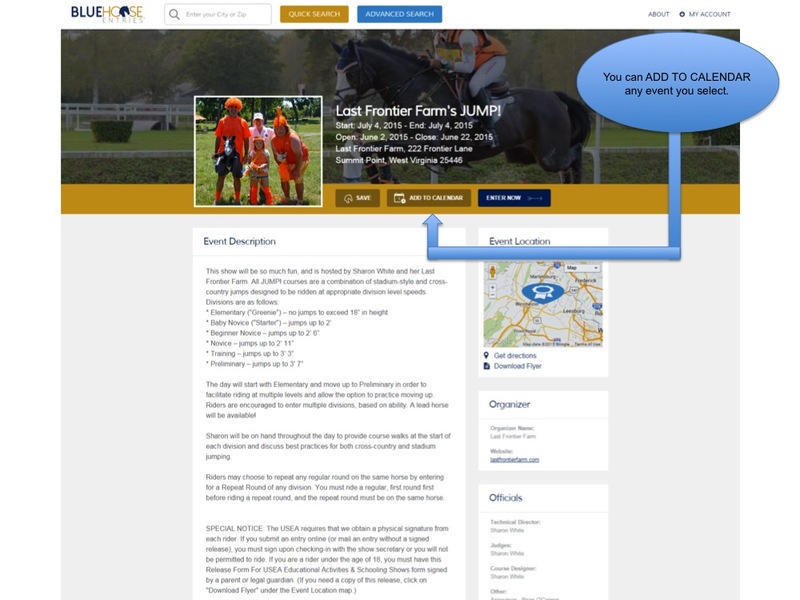 With an organizer account, you will be able to list events, and receive entries online. 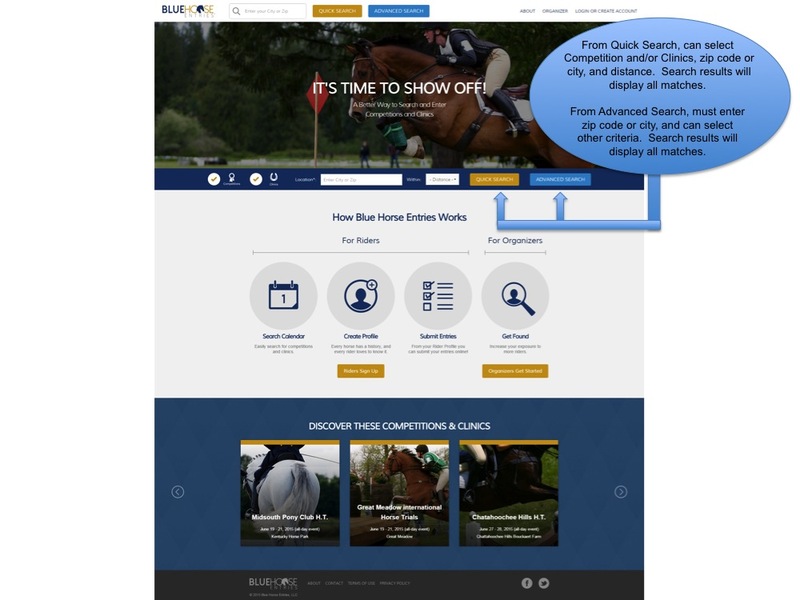 Types of events you can list include schooling shows (including CT, MT, HT, dressage, jumpers), clnics, camps, hunter pace, and recognized eventing shows. HIGHLIGHTS FOR YOU: It is FREE (so no risk there! ), no rider entry can be submitted without full payment, all payments go directly to your bank acount, no rider entry can be submitted for a reconized eventing show without uploading a signature page, no re-typing entries, plus we provide additional marketing and promotion for each event listed with us. 12. Who can I call if I have questions? 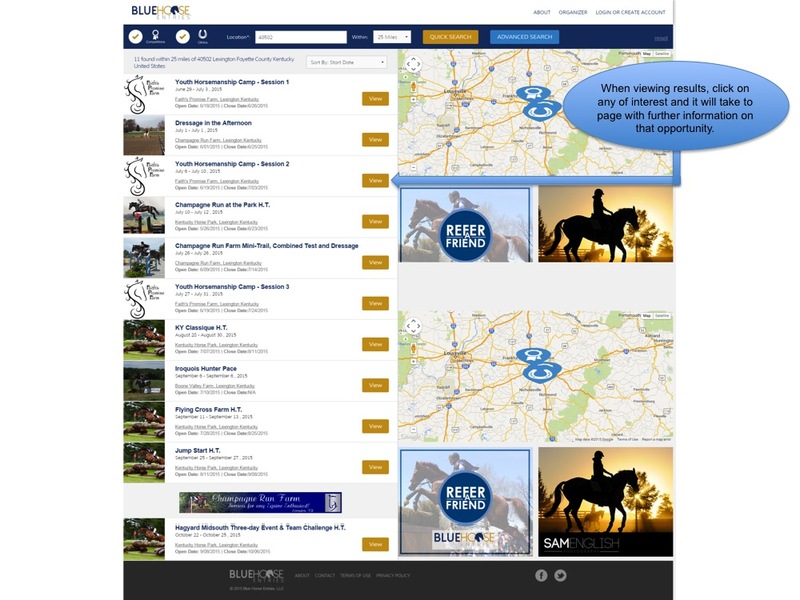 You can always contact Blue Horse Entries at 859-493-2125, or email at ridewithus@bluehorseentries.com.